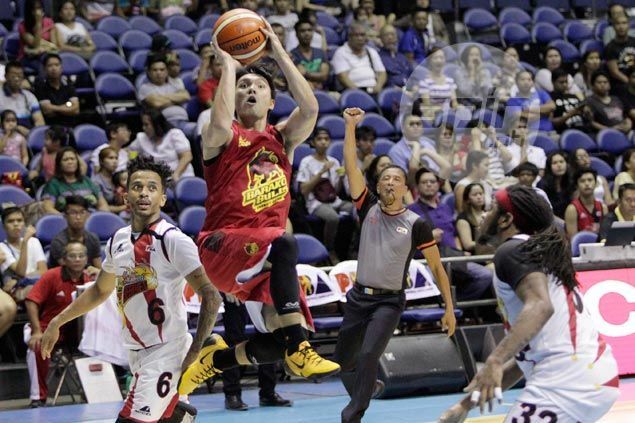 AFTER stops at Air21, Barangay Ginebra and Barako Bull, Joseph Yeo is bound for his fourth team in less than a year. The high-scoring guard out of De La Salle is on his way to GlobalPort, which will hand over to Barako Bull its first-round pick in the PBA Rookie Draft in a straight trade, sources told Spin.ph on Friday. The trade, which sources said was sealed by officials of GlobalPort and Barako in a meeting on Friday morning, is expected to kick off a wave of transactions that will involve more players from both sides. Yeo, at least, is expected to stay at GlobalPort under the wings of fellow La Salle alum and team owner Mikee Romero after a whirlwind season split with Ginebra and Barako Bull. However, Yeo's arrival creates a glut in the combo-guard position for a team that already has volume shooters Terrence Romeo, Ronjay Buenafe, Denok Miranda, Anthony Semerad and Keith Jensen, not to mention Stanley Pringle. That has all the more fed talks that one of these players will eventually be shipped out by GlobalPort, with Pringle's name among those being floated around in trade talks. On the other hand, the trade has given Barako three first-round picks in the 2016 draft - the Energy's original pick, San Miguel's and now the one from GlobalPort which the Batang Pier actually acquired from Meralco in an October 2013 trade involving Gary David and Chris Ross. Globalport’s original 2016 pick has already been traded to the Star Hotshots. On Thursday, Barako acquired Brian Heruela from Blackwater in a one-on-one trade for Carlo Lastimosa, but neither player is expected to stay put for long. Insiders expect the guard-heavy Energy to eventually ship the Cebuano guard, likely to San Miguel Beer where he can be reunited with college teammate June Mar Fajardo, while Lastimosa may eventually be bound for NLEX where uncle Jojo Lastimosa is an assistant coach. On the other hand, Ginebra has been silent on a rumored reshuffle in the offseason.